We fell in love with Denmark upon first glimpses out the plane window. It is a country of more than 500 islands. From above, we saw fields of mostly green, but also furrowed dirt awaiting planting, alongside bright yellow mustard fields, and plentiful green forests. There is a long and deep history here and the Danes are rightly proud of their heritage. 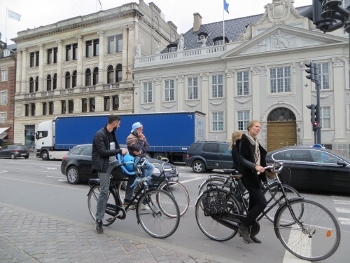 We landed in Copenhagen and were impressed to see that almost everyone rides a bike. It seems there are more bicycles and boats than cars. This eco-conscious town has caught the attention of leaders worldwide on how to build bike-friendly cities. 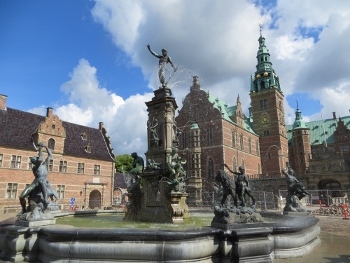 The Danes set the pace for a healthy lifestyle. If you are here between May and August, you’ll see the sun set later, and rise early. When the sun is out, locals set up chairs outdoors and sit soaking up the sunshine and one another. We spent a few days in Copenhagen and rode a bike, soaked in some rays and didn’t want to leave. Here are our recommendations on what to do & see, where to stay, dine & spa, and how to get around. Nyhavn Harbor: King Christian IV built a canal system after he visited Amsterdam, and it’s the best way to see Copenhagen. 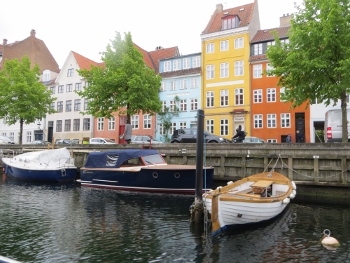 You’ll see the churches, castles, 17th century old homes, new buildings and more along the scenic canals of Christianshavn. Before leaving Nyhavn canal, keep a lookout the home of Hans Christian Andersen, Danish poet & author, who lived next to the canal. Strøget: Walk the longest pedestrian shopping street in Europe, and shop for Danish designs in homewares, clothing, and architecture. We enjoyed seeing the latest fashions at designer stores like Day Birger et Mikkelsen, Bitte Kai Rand, Malene Birger, Henrik Vibskov. 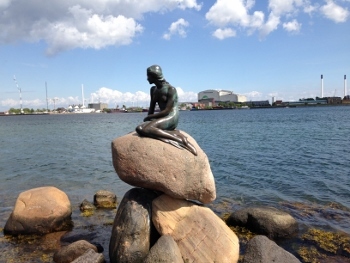 Little Mermaid: One of the most popular sites to visit is the Little Mermaid, little darling of Copenhagen. This bronze and granite sculpture was inspired by Hans Christian Andersen’s tale about a mermaid who falls in love with a prince, and gives up everything to be on land near him. 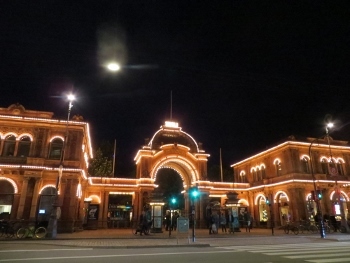 Tivoli Gardens: If you’re looking for fun and entertainment, visit the famous Tivoli amusement park, where you’ll find a theatre, rides, gardens, and great music! Visit at night when over 100,000 lights will dazzle you. 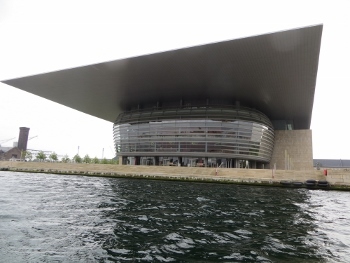 Copenhagen Opera House & The Royal Library “Black Diamond”: Amazing architectural design and right on the water. You can see both of these buildings from the canal tour as well. Copenhagen Spires: Admire the intricately designed spires in Copenhagen’s skyline including the old Stock Exchange’s spire of entwined dragon tails, and the baroque Church of Our Savior’s helix spire with exterior winding staircase that you can climb up to get great views of the city. 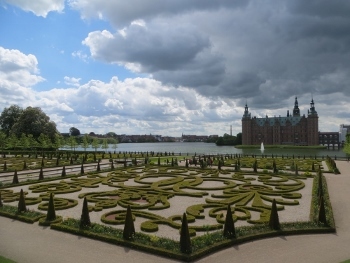 Rosenborg Castle: Built in 1607 by King Christian IV in the Dutch Renaissance style. Crown jewels, royal art treasures & regalia can be found in this castle, located in the King’s Garden, center of the city. Amalienborg Castle: Known as the winter royal residence and a fabulous 17th century Rococo style palace. Be sure to watch the changing of the guards. Christiansborg Palace: The Royal Family used to live here, but now it’s the seat of The Parliament and Prime Minister. 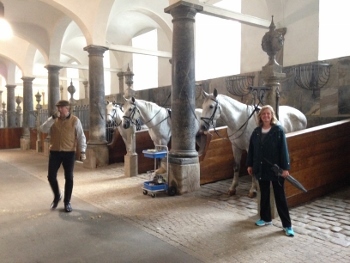 We visited early one morning and saw the royal white horses in their stables, right in the palace courtyard. FURTHER OUT, BUT WORTH IT!!! Fredericksborg Castle Visit the 17th century Fredericksborg Castle, the largest Renaissance Castle in Scandinavia built by King Christian IV. 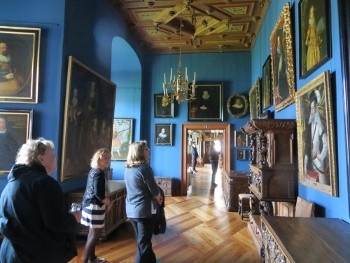 Mette Skougaard, Director of Fredericksborg Museum, arranged for our guide Emma Nielsen to share her wealth of knowledge and enthusiasm with stories from the castle’s 500 years of art and history. You’ll want to spend at least a few hours, to tour the 90 rooms on the 7 stories of this castle. Don’t Miss! The 18 Carl Bloch paintings in the King’s private chapel. They are stunning. And take time to walk through the beautifully manicured gardens. Louisiana Museum – Modern art museum with an exceptional collection of modern artists. Although this is farther out from the city, many come here to see special exhibitions, concerts and the sculpture park, in a beautiful location. D’Angleterre is known as Denmark’s most prestigious and elegant luxury hotel, with a legacy of style and passion dating back to 1755. After a long flight, we were delighted to arrive to our Copenhagen palace. Fresh floral arrangements, beautiful chandeliers, marble décor and uniformed doormen welcomed us with white glove service upon our arrival. Located in the heart of Copenhagen, next to the city’s greatest monuments like the Royal Danish Theatre, The Kings New Square, couple blocks from the famous Nyhavn Canal, and around the corner from the Stroget. 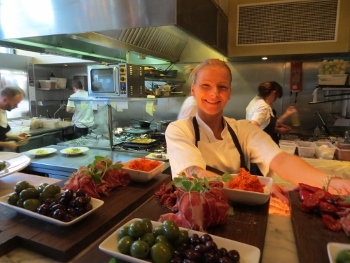 General Manager Lucas Johansson, and every member of the staff share a passion for hospitality. 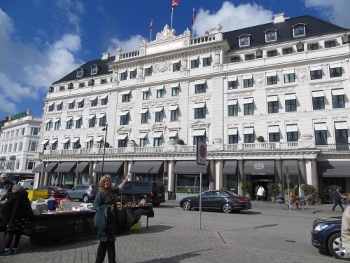 A high level of service has earned this Old Danish dame its 5-star deluxe rating. 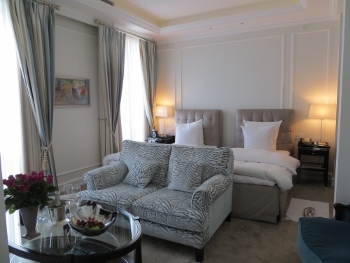 There are 90 spacious suites, rooms beautifully designed, comfortable with modern touches, grand bathrooms and balconies overlooking the city’s squares. Don’t miss the breakfasts in Marchal’s, the hotel restaurant – what an array! Everything is fresh and healthy – fresh nuts, vegetables, berries, cheeses, cheeses, smoked salmon, sardines, muesli, scrambled eggs, sausages, potatoes, mushrooms, bacon, proscutti, pancakes, Danish pastries, all freshly squeezed juices & smoothies, and homemade breads. 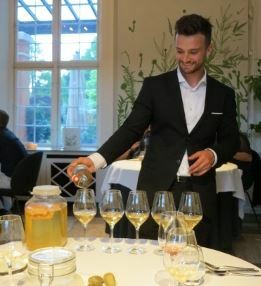 Mielcke & Hurtigkarl: Venture out to the Frederiksberg royal gardens for a romantic stroll, then dine at Mielcke & Hurtigkarl, a Michelin star restaurant located in a lovely courtyard in the park. We were amazed at the almost 14 course meal, with a series of appetizers leading up to the main dishes. 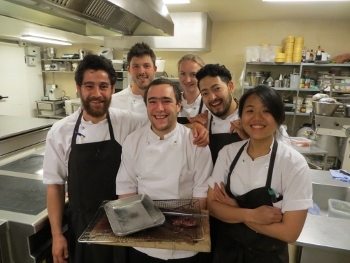 Executive Chef Jakob Mielcke has been noted as one of the 100 most creative chefs in the world by Phaidon. 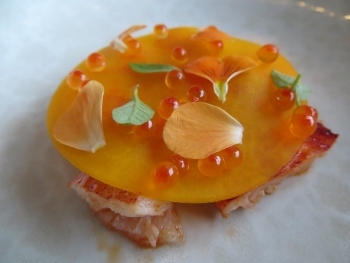 His creativity shows in the innovative dishes presented like langoustine with sake & red berries, pigeon with black currant, morrels, and cedar, birch sap, rhubarb ice cream. Our palettes were filled with new flavors and textures. Thomas Amir Korby, Restaurant Manager shared, “It is a curious and stylish cabaret of gourmet experiments, contemporary art and elaborate designs set to create a total experience.” Thomas also presented extraordinary juice infusions he brews on a small scale, to pair with our dishes, an art in and of itself. 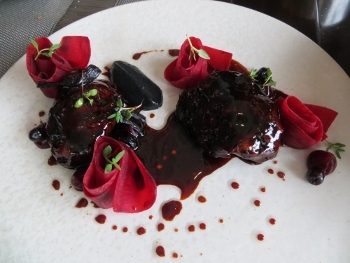 Marchal: Enjoy the culinary wonders of Michelin-awarded Executive Chef Ronny Emborg at Marchal, on the main floor of D’Angleterre at Marchal. 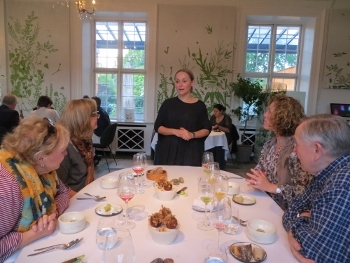 The presentations, the flavors are unique and delightful twist of Nordic and French classics. Produce is sourced locally, and from Marchal’s own organic garden. This is one of the top places to wine & dine in Copenhagen, where the “who’s who” of the town can be found. Fiat: If you want to have a less formal dinner, and enjoy some delicious Italian food, book a reservation here. This spa represents a Nordic oasis of luxury and beauty for ultimate relaxation, wellness and revitalization,” shares Owner Laura Bonné. My spa therapist tailored my treatment and afterwards, I felt rested and rejuvenated. Laura also designs a line of natural and organic products for the face and body. Our favorites are the oxygen elixir beads and the face cream. 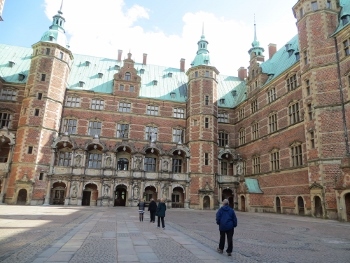 We walked around Copenhagen, and took some taxis, but were glad to have made reservations with these limousine services for our airport pick-ups, and longer transfers to see sites in the surrounding area. Both are top-notch and we highly recommend them. Copenhagen Limousine Service: When you need to find a limousine or car service that can get you to/from the airport, meeting, or event, or take you on sightseeing tours in the city and beyond. Copenhagen Limousine Service is the oldest and largest limousine service provider in Denmark. They also have a global network so they can serve transportation needs in cities throughout the world. We were impressed with their prompt, professional, and attentive service. 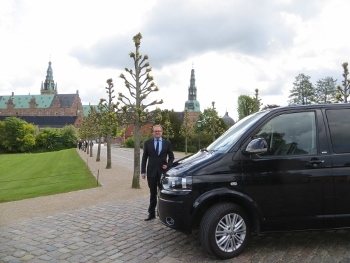 Blacklane Blacklane provides professional limousine and car service throughout Copenhagen and the surrounding area. Our driver was professional and on time, and drove us safely to our destinations. Blacklane offers luxury transfer services throughout Europe. You can book a chauffeur who will drive you within most European cities. Global Adventuress would like to thank D’Angleterre for a wonderful stay and hosting us with Danish hospitality, and the restaurants Marchal and Mielcke & Hurtigkarl for fabulous dining experiences, Copenhagen Limousine Service, Blacklane for our transportation, and Amazing Space for the spa treatment, and Stromma Group for the Canal Tour. We also would thank Travelpro for the carry-on spinner suitcase, a favorite of travel crews and avid travelers, as well as DK Travel for the Denmark travel guide. Stromma Group Get tickets for the grand canal tour and see Copenhagen’s highlights from the canal. We loved this tour so much – we went twice! COPENHAGEN TOURISM OFFICE Visit this website to help you plan your trip to Copenhagen and the surrounding area. Lots of great information! Seabourn Copenhagen is a great city to depart on a cruise. We choose Seabourn, a fabulous luxury cruise line, to cruise through the Baltic and Scandinavia region.